Encore release day! I’m over at Melanie Marshall’s “Scattered Thoughts and Rogue Words” blog today to start off the Encore and Symphony in Blue Blog Tour! 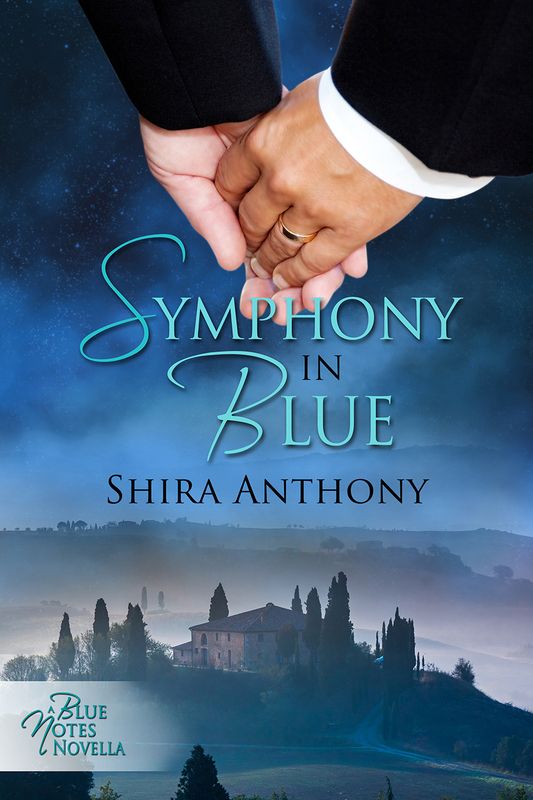 Symphony in Blue (December 25th release date) is my 10th Dreamspinner Press release, so I’m celebrating the release of both books with a great blog tour contest! NOTE: Encore is chronologically the first book in the Blue Notes Series and a great place to start if you’ve never read the other books. All Blue Notes novels are standalone books that can be read in any order. You can purchase Encore at Dreamspinner Press by clicking here. John wound his way around gaggles of girls who blocked the hallway, turning it into a twisted obstacle course. He dodged a locker door here, someone slinging a backpack full of books there, and nearly got whacked in the gut by a kid holding a trumpet case. John’s elbow connected with the hard fiberglass of the case as he pivoted to avoid the collision. Shoot. That was going to make one big bruise. Not to mention it hurt. He rounded the corridor and stepped inside the band room, relieved to find it empty. He leaned against the wall and took long, raspy breaths to try to calm his pounding heart. He wiped the sweat off his face, then rubbed his hands on his brown polyester pants. “What?” John nearly jumped when he realized he wasn’t alone. His voice sounded high and girlish to his ears. “Are you hiding?” The speaker was a kid with wild brown hair and a hint of shadow on his jaw. He sat on one of the chairs by the podium, twirling a violin bow around like a baton. John hadn’t seen the kid when he’d first come in, but it was clear the kid had seen him. “I… n-no.” Damn. Was he stuttering now? He hadn’t stuttered this badly since elementary school. “Roger Nelson.” Roger ran a hand through his curly hair, which only served to make it stand up on the top of his head like horns. Roger reminded John of a devil, and it wasn’t just the hair. “N-nice to m-meet you, Roger.” John walked over and offered Roger his hand. “I guess.” He sure wasn’t going to tell Roger about his parents’ divorce, or about how they’d decided they no longer had the money to send him to private school one year before graduation. “I hear you’ve got a great orchestra.” At least he wasn’t stuttering anymore. He’d spent years in speech therapy in elementary and junior high school, but when he was nervous, it sometimes came back. When Roger didn’t respond, John asked, “How about you?” He realized how stupid a question it was the instant he’d asked it. Of course the guy played violin. “Oh.” What do you say to that? He had no idea if Roger was joking, but he sure wasn’t going to embarrass himself by finding out. Roger stood up and began to put his violin away. He was a little taller than John—who was now nearly six feet—with a lanky body and surprisingly broad shoulders. Good-looking too. John’s face warmed once more. “Is Mr. Constantino in his office?” he asked, mostly because he was having a really hard time not staring at Roger. He didn’t really need to speak to the orchestra director. “Thanks.” John waited for Roger to say something, but when he didn’t, John made his way over to the office at the far end of the room. By the time John had finished talking to Mr. Constantino, grabbed his books from his locker, and headed outside to the main courtyard, the sun was beginning to set. The air was cool, not surprising for late October in northern Ohio, so John set down his pack and zipped up his poplin jacket. The smell of fallen leaves mingled with a more pungent odor. Marijuana. He looked around and saw Roger seated on the low brick wall at the edge of the courtyard, smoking a joint. “Hey.” Roger inhaled and held his breath. A girl with hair down to her waist walked over to them. John was sure Roger was going to hide the pot, but instead he held it out to her and she took a long toke. Roger put his arm around the girl’s shoulders and shot John a knowing look. “Who’s he?” the girl asked as she blew smoke in John’s face. “I’m John.” John offered the girl a smile. He’d decided shaking hands was not public school etiquette after meeting Roger earlier. The girl just stared at him, then turned to Roger and proceeded to kiss him. Not just any kiss. A french kiss. John felt sick to his stomach watching. He’d always thought kissing girls was gross. Now he was sure of it. The girl glared at Roger, who ignored her. “I… ah… s-sure.” John wasn’t sure at all, but Roger was the only kid who’d acknowledged his existence since he’d arrived at Marysville and he figured it’d be rude to turn down the offer. He and Roger walked in silence to the parking lot, where Roger led him to an enormous brown Buick. Small blue and pink spots dotted the exterior where someone had, he guessed, sanded off patches of rust in preparation for a paint job that never materialized. The windows were rolled down and the doors unlocked. “St. Barnaby’s,” John corrected, feeling keenly awkward. “Oh.” John’s cheeks burned and he stared down at the blacktop, focusing on a weed that had forced its way through a crack and pushing it with his shoe. The slippery fabric of John’s pants propelled him over the vinyl bench seat as if someone had greased it. He stopped sliding about a foot away from where Roger was, key already in the ignition, his left hand releasing the parking brake. John looked around for a seatbelt. There was none. “Always buckle up!” His mother’s voice resonated in his brain, and for once, he ignored it. Not for long. The Realtor had come by the other day, and John thought he’d seen her drool when his mother told her they needed to sell quickly. He wondered where they’d end up. Probably one of the duplexes closer to downtown—the places people moved in and out of on a regular basis. He often walked the dog by the duplexes on garbage night, curious as to what ended up on the tree lawn after the latest renters left. He’d found an entire stack of LPs one night, including a boxed set of Tchaikovsky’s greatest hits and a recording of the Singing Nun. He’d hidden them in his closet—God forbid his mother find out he’d been going through other people’s garbage. She’d have a fit. He hummed a bit of “Dominique” and smiled. He’d always liked that song. Dominique, neekah, neekah…. Roger reached for the radio as they stopped at the light. The radio blared, and John winced inwardly. He didn’t like loud rock music—it gave him a headache. “We’re not gonna take it,” Roger sang along. “Gonna break it, gonna shake it, let’s forget it better still.” Roger looked over at John and grinned. “The Who. That’s who.” Roger snorted, a look of smug satisfaction spreading across his face. “Oh.” John had heard of them, although he’d never heard their music. As they drove, John watched Roger. He wore a pair of off-white painter’s pants with a half-dozen pockets and a hammer loop. John noticed how the pants pulled at Roger’s crotch when he sat. Roger’s shirt was a blue plaid flannel, unbuttoned to reveal a dusting of curly hair on his chest. John’s mouth was dry, so he chewed on the inside of his bottom lip. He felt a pulsing sensation in his groin and shifted to accommodate his embarrassing erection. He prayed Roger wouldn’t notice. Disgusted with himself, he thought of his first and only discussion of homosexuality with his father. They’d been sitting in the living room, watching yet another report about the war in Vietnam. It was pretty much the same thing every night—a daily tally of the number of American troops killed and the growing protest marches at home in the US. But this night, there was a story about a riot in New York City at a place called Stonewall. John, who was about fourteen years old, just stared at the images on the TV. “What’s a fluter?” he asked. “Why not?” John was genuinely curious. Six months later, after Raymond Lessor kissed him in the coatroom, John figured out what his father had meant. He was exactly the kind of man his father had been talking about. “You okay?” Roger turned down the radio and looked at him. “Yes. I’m great.” He forced a smile and realized they’d just turned onto his street. “Oh, that’s my house, about halfway down.” He pointed. Roger pulled into the driveway a minute later and John, backpack held in front of him like a shield, climbed out of the car. Slid, really. “Thanks, Roger.” John waved tentatively, feeling like a complete idiot. “It’s cool.” Roger cranked up the radio and pulled back out of the driveway. He waved, then gunned the engine and took off down the street, leaving a cloud of white smoke in his wake. John waved the smoke away and watched the car disappear around the corner. “Cool,” he repeated as he swung his backpack over his shoulder and headed into the house. Congrats on the release of Encore! I really love second chance at love stories and this one really has my interest since you first started talking about it months ago. I really don’t have a favorite music, but it would be a mix of different types of classical, pop, country etc. But I have admit there is some music that I don’t like. I’m still a crunchy-guitar-and-soaring-harmonies kind of girl (I hesitate to call it “power pop”), but I like a little bit of everything. Going to see old-school NYC garage-rockers the Fleshtones and guys from the Baseball Project play tomorrow night…I’ve loved the Fleshtones since I was a kid and have never gotten to see them live, so I’m pretty excited! Ooh, another addition to the series! I honestly listen to all sorts of music, but I’d have to say rock usually wins out. I love pretty much all music, some more (rock and classical), some less (rap and country) than others, but still – it’s all great in its own way. I was raised on Classical (Bach is a genius), showtunes (yep, still know all the words) and folk songs (*sings* if I were free, to speak my mind…), then I discovered the Beatles when I was 12 and I never looked back. 😀 She loves you – yeah, yeah, yeah. Music themed books! How have I missed this series? I enjoy almost all kinds of music and you can usually tell what mood I’m in by what’s playing. 🙂 It sounds like a cop out answer, I know, but shuffling my playlist is like one big free-for-all radio station. I don’t have a favorite kind of music, but I enjoy classical, and love the way it’s used in this series. Looking forward to reading this and the next book! My favorite kind of music is country. I’ve listened to it all my life although it’s changed a lot over the years.